Octopus is an end to end Adaptive Optics Simulation tool. This means that the input is made of random phase screens (usually 10-20 of them, but more can be simulated if necessary), following von Karman statistics, representing the atmosphere. These phase screens are assumed to be infinitely thin. Extended layers (like the ground layer) are modeled with several thin screens. The phase screens are sent to a wavefront sensor module, which calculates the WFS measurement using Fourier Transforms. 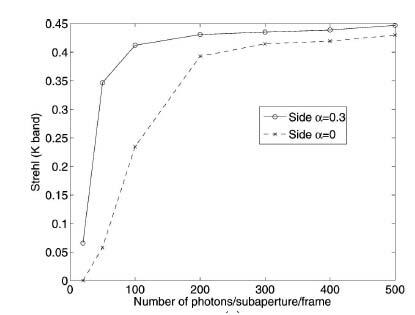 This allows to calculate (in the case of a Shack Hartmann sensor), the shape of the spot in each sub-aperture. A centroiding algorithm (usually a Weighted Center of Gravity) is used to extract the measurements. The measurement is then multiplied by a command matrix, to yield the commands to be sent to a deformable mirror. The shape of this DM is then computed from the commands, and subtracted from the atmospheric phase screen (with a delay). The phase screen is then moved, to simulate the evolution of the atmosphere. The output of the code is the corrected Point Spread Function, of which astronomically relevant parameters (Strehl, encircled energy, PSSn) can be extracted. This method is very close to the physics of what really happens in a real AO system. This makes the simulation relatively accurate (as long as all relevant physical processes are modeled), but relatively slow, since usually several thousand time steps are needed to realistically model a system. In order to speed up the simulation, Octopus is fully parallelized, and uses a cluster of several tens of PCs, running a single simulation simultaneously. This allows simulation of extremely large and complex systems in a reasonable amount of time. Figure 1. Picture showing the cluster of PCs, and the cabinets containing them, in which cool air is circulated throughfans. The picture was taken when the cluster was not yet complete. SCAO: is the simplest. Only one deformable mirror, and one wavefront sensor. GLAO: One adds WFS modules to the preceding case, and the GLAO system can then be modeled. LTAO: Like above from the hardware point of view. However, the reconstruction algorithm is different, since here we use the "virtual DM" approach, allowing us to optimize the correction quality in one direction, instead of having the most homogeneous correction (over a large field like in GLAO). MOAO: Such AO is simulated as a particular case of LTAO, .i.e with a particular direction of correction optimization. MCAO: The most complex system from a hardware point of view. Several WFSs and several DMs (conjugated to different heights) are used, to have a good correction quality over a wide field of view. Since Octopus runs in parallel, very large systems can be studied. The largest SCAO system which has been run is an order 200x200 system, corresponding to an EPICS-like case. Although this system takes a few days to run, it has demonstrated the capability of Octopus to cope with a large number of degrees of freedom. The largest MCAO system which has been run is similar to MAORY, where 84x84 WFSs are used to observe 6 LGSs, one 3x3 NGS and controlling 3 Deformable mirrors. This corresponds to a command matrix of ~50000x20000 elements.We currently use 8000x8000 pixel phase screens routinely (corresponding to a physical size of ~250m, with the E-ELT pupil sampling). It should be possible to at least double that size if needed. The pupil of the E-ELT is usually simulated with ~1300 pixels across the diameter, and the largest simulated pupil was ~4000 pixels. Larger sizes than that (to for example sample more finely the E-ELT pupil for segmentation effects) should still be possible with minor modifications to the simulation tool. Note that Octopus has several reconstructors available, which allows to study the impact of the algorithms on final performance. Generalized fitting error, cause by the small number of DMs compared to the number of turbulence layers. Turbulence layers are assumed to be infinitely thin. Most of these effects can be switched on or off to understand their impact of final performance, and see if their reduction would yield a significant gain in performance. The standard Matrix Vector Multiplication (MVM), which is a regularized versions (using MAP) of the standard MVM. FriM, the Fractal Iterative method, currently limited to SCAO and GLAO. FriM-3D, which handles MCAO is currently being implemented and tested. The Fourier Transform Reconstructor (FTR), limited to SCAO and GLAO has been tested. The comparison of algorithms on SCAO has been reported in a refereed paper, see [RD1] from which Fig.3 below is extracted. Several new reconstructors are expected to be included in Octopus in the coming years, as a result of the Austrian in-kind contribution study for the E-ELT. The Adaptive Optics Facility (AOF) will make one of the UT of the VLT an adaptive telescope, by replacing in 2014 the current secondary mirror by a deformable secondary mirror. Octopus has been used to build the performance analysis of the 2 adaptive optics systems, GRAAL and GALACSI, which will use AOF. More recently, ESO studied several options for a future High-Strehl instrument replacing NACO, when AOF becomes available. A total of 5 different AO modules have been simulated with Octopus and analyzed. In that respect, new strategies for reconstruction and control have been integrated into Octopus, to test state-of-the-art approaches like a "dual LGS wavefront sensing mode" to improve narrow field AO sky coverage, and also a "hybrid MCAO" system. Octopus is also regularly updated, in order to include more and more specific effects of interest for the future large AO systems. In particular, several urgent needs are related to the preparation for AOF, but these upgrades will be even more relevant to prepare the E-ELT. Methods for regular updates of the reconstructor during closed-loop AO correction, to cope with the misregistrations issues mentioned above. Spot elongation: We introduced non Gaussian sodium distribution to study its impact on the performance of the ELT, which should be more sensitive to this parameter than smaller telescopes ([RD4]). Side launch of the laser guide stars was intensively studied, yielding two refereed papers on the performance of GLAO and LTAO with side launch ([RD2],[RD3]). Effects of the conjugation height of the deformable mirror, in Ground Layer AO. This is actually just a particular case of MCAO, with a single DM, conjugated to 375m. Study of spot elongation issue led in 2010 to demonstration of benefits of an noise-optimal reconstruction for GLAO and LTAO, using simulations on Octopus. Figure above: LGS-GLAO for the E-ELT, simulated with spot elongation and laser launch telescopes on the side of the primary mirror. Dashed line represents flux requirements of the LGS when a classical reconstructor is used. Solid line show the benefit of a noise optimal modelling in the reconstructor to reduce the size of the Ensquared Energy box, even at low LGS flux. Figure above: LTAO for the E-ELT from RD2, simulated with spot elongation and laser launch telescopes on the side of the primary mirror. Dashed line represents flux requirements of the LGS when a classical reconstructor is used. Solid line show the benefit of a noise optimal modelling in the reconstructor to increase the Strehl. The aim of the Mathematical algorithms and software for ELT adaptive optics Austrian in-kind project is the development of fast algorithms and software for the correction of degraded images due to atmospheric turbulence. The project consists of four subprojects that address different aspects of adaptive optics. In particular, the Austrian in-kind project will study SCAO (XAO), MCAO and MOAO (GLAO & LTAO) systems, and provide improved speed/performance with respect to standard matrix-vector-multiply (MVM) reconstruction techniques. The role of the ESO AO simulation team is to define the reference cases for each AO system, and simulate their performance in Octopus for the MVM case with respect to different noise and turbulence levels. The Austrian in-Kind team will also use Octopus with their novel reconstructors to evaluate their AO performance. In order to get quick estimation of first order AO performance, we use analytic AO simulation tools. Mostly, we use Cibola, an analytic (Fourier) tool developed by Brent Ellerbroek. It allows quick calculations of PSFs of many kinds of AO systems (SCAO, GLAO, MCAO, MOAO…). Its main limitation is the inability to model LGS performance. Therefore, LTAO cannot be modeled accurately. It should be noted that compared to numerical simulations, analytical ones tend to yield optimistic performance. FriM-3D, the tomographic version of FriM is being tested right now, allowing faster calculation of the reconstructed phase. A new reconstruction algorithm based on the ONERA LQG approach will be implemented in the framework of the AOF (downgraded to a single MVM). 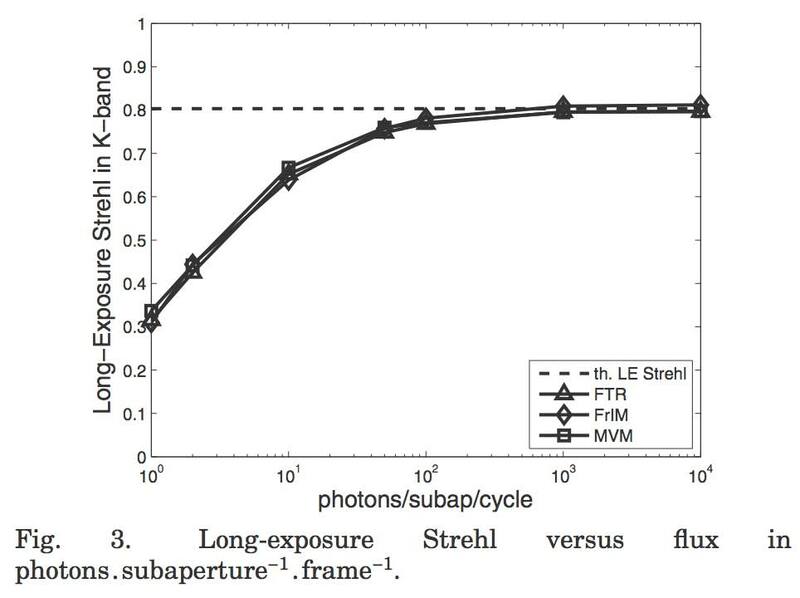 [RD1] Montilla et al, Performance comparison of wavefront reconstruction and control algorithms for extremely large telescopes, JOSA A, Vol.27 (11), A9-A18, 2010. [RD2] Clare et al, Optimal noise weighted reconstruction with elongated Shack-Hartmann sensor images for laser tomography adaptive optics, Appl. Opt, Vol. 49 (31), G27-G36, 2010. [RD3] Béchet et al, Optimal reconstruction for closed loop ground layer adaptive optics with elongated spots, JOSA A, Vol. 27(11), A1-A8, 2010.